Veeco MOCVD systems provide key advantages for GaN-on-Si production, including low particle counts and excellent yields. Gallium nitride (GaN) is enabling a new generation of power switching devices that offer higher efficiency and switching speed than the traditional silicon MOSFET, to satisfy the demands of today’s high-performance electronics. Veeco MOCVD systems provide key advantages for GaN-on-Si production, including low particle counts and excellent yields. Demand is ramping up for a new generation of power electronics, to help companies around the globe implement new, more energy-efficient power architectures. To meet this growth, GaN-on-Si technology is rapidly moving from R&D to full scale production of highly efficient components, cost optimized to meet the power semiconductor industry’s requirements. As the world’s leading expert in GaN processing equipment, Veeco MOCVD technology is providing a platform for GaN-on-Si production breakthroughs, solving cost-per-wafer and performance solutions leading to commercial viability for GaN-on-Si power electronics growth. 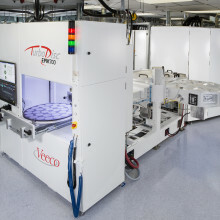 Just as Veeco MOCVD technology has helped drive spectacular growth in the LED market, we offer highly efficient, proven manufacturing systems for GaN-on-Si epitaxy. Our single wafer Propel™ Power GaN MOCVD System set world standards for flexibility and process capability while lowering total cost of ownership. Veeco offers a range of industry-leading MOCVD equipment designed to maximize throughput while lowering cost of ownership. Our sales team is ready to help.